If you dont like to wear falsies or if you want more natural looking long lashes, guess what now theres a solution available from the pharmacy. Theres a product out in the market called Latisse, which is a brand name for a generic drug called Bimatoprost Opthalmic Solution. This solution was originally used to treat glaucoma in the eyes. The patients were pleasantly surprised to see that the side effect of this medicine was unusual growth of lashes. The makers of Latisse have packaged it to be a solution for hypotrichosis (having inadequate or not enough eyelashes), used to grow eyelashes, making them longer, thicker and darker. The original medicinal use for glaucoma was to put it directly in the eye, but with Latisse you only apply it to the lash line. The only negative side effect that Ive heard of with Latisse, is increased brown pigmentation in the iris of the eye if the solution gets into the eyes. That would be a problem for light colored eyes like mine, but not for dark colored eyes. In order to see results you must use the liquid religiously for about 16 weeks. 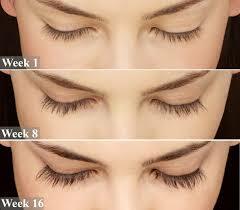 If you stop using Latisse, the eyelashes go back to their natural length and thickness. In the US, and some other countries Latisse can only be acquired through a prescription from a doctor. It is also quite pricey, so if you are on a budget, there are generic versions available. I found one called Careprost and it costs only $11 US. You can buy it online.